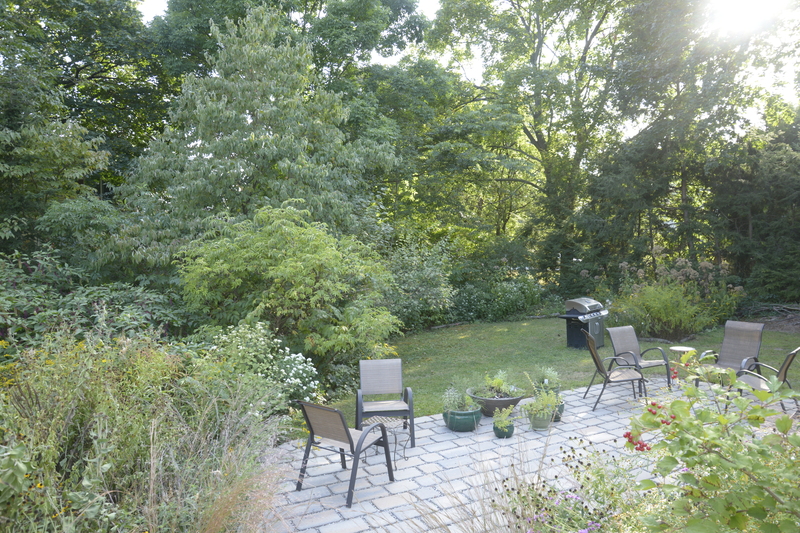 A naturescaped garden: This backyard, which includes dozens of species of native trees, shrubs, perennials, and grasses, provides a pleasing environment for the homeowners and helps to restore a small part of the natural environment. Naturescaping is a new kind of landscaping that pays careful attention to the natural environment—the climate, soil, underlying geology, and surrounding vegetation—with the ultimate goal of restoring the landscape to the sustainability of its natural state. That statement is a mouthful. Let’s take it apart. Naturescaping is a new kind of landscaping. Traditional landscaping usually means arranging an outdoor environment solely to suit human needs: improving it by carefully designed planting and hardscaping. This kind of landscaping attempts to control nature by imposing order, controlling views and lines of sight, making the site useful and beautiful. Naturescaping also attempts to make land more useful and more beautiful, but always in accordance with nature. Here’s a very simple example: suppose you want a specimen tree on your front lawn. The site receives full sun, and you want pretty flowers in early spring. You ask a traditional landscaper to help you select one, and she suggests a Japanese weeping cherry. That would certainly be very pretty (at least for the couple of days in early spring while it’s in bloom). In contrast, if you ask a naturescaper to suggest some options, she would first check out the soil, look at the surrounding landscape, and suggest two or three native species that would do well. Of those, you ultimately select a serviceberry, which will flower prolifically in spring, attracting early pollinators, and fruit abundantly in June, supplying food for scores of birds. Lovely fall color is a bonus for you and other humans. Your choice pleases both you and nature. That’s naturescaping. Next part of the definition: Naturescaping pays careful attention to the natural environment—the climate, soil, underlying geology, and surrounding vegetation. This is the essence of naturescaping, and we already saw it in our first example. When most homeowners buy plants, they do not pay attention to the natural environment. They see a bare spot in the garden, go to the local garden center, and buy a pretty plant, regardless of whether it’s suitable for the site. That plant is most likely not native to this region, so even though it may be appropriate to our climate, it will almost certainly not be a good fit with the surrounding vegetation, so it may spread aggressively into the surrounding environment. It will not be attractive to native pollinating insects that are the primary food for baby birds. And it’s not the homeowner’s fault: native plants are not generally available. The plants we see in garden centers originally came from many different parts of the world and have been extensively cultivated and hybridized. They are often not even marked by their correct species name, and the care instructions on the label are as general as possible. We buy what’s available, whether or not the plant is suitable for the site. As a horticulturist, one of the most common problems I see is “the spot where nothing will grow.” Clients show me a dying rhododendron or cherry laurel or azalea, mention that this is the second or third time the same variety of plant has done poorly in this spot, and ask what I suggest. Or they point to a shady spot where they’ve repeatedly tried to establish a lawn but all they get is moss. They expect me to suggest enriching the soil or fertilizing. Neither of those things will solve the problem. However, the solution is really quite simple: select a plant that’s well adapted to the particular site. Lawn grass won’t grow in a very shady site, so plant a lovely shade garden of ferns and native perennials. Or perhaps the soil is too alkaline for an azalea, or the spot is too shady for that particular type of azalea. The solution is to find the plants that will grow in that spot. Whatever the soil, water, or light situation, there are beautiful plants that will thrive. You just have to take what nature gives you and work with it. That brings us back to our definition of naturescaping: naturescaping is landscaping with the ultimate goal of restoring the landscape to the sustainability of its natural state. The environment we live in was once abundantly rich, productive, and sustainable. It was a mixed hardwood forest, interspersed with grassy, flowery meadows. There were thousands of species of trees, shrubs, flowering perennials, grasses, ferns, and mosses, plus a few annuals. This wealth of plant life supplied food for an abundance of animal life—thousands of species of birds and butterflies, many thousands of insect species, dozens of mammals, reptiles, and amphibians, a wealth of fish in the rivers and ponds. That profusion of life is gone, and in its place we have perhaps a few dozen species of ornamental plants that originally came from all over the world: yew, arborvitae, boxwood, euonymus, flowering cherries, rhododendrons, azaleas, mountain laurels, Japanese barberry, holly, burning bush, ornamental pears, Shasta daisies, forsythia, hostas, hydrangeas, spring flowering bulbs. A few of these plants, spaced widely apart, surround a sea of pristine lawn grasses. That’s traditional landscaping. But nature is left out. A simple set of statistics sheds some light here: 90% of birds feed insects to their young, and 90% of insects can eat only native plants. In a garden composed of lawn grass, hosta, Japanese azaleas, Bradford pear, and forsythia, there’s nothing for animals to eat. The garden looks green and pretty, but the food chain is broken. The ecosystem is bankrupt. But substitute native shade-loving perennials for the hosta, and you’ll attract pollinators and the birds that eat them, not to mention the birds and small animals that eat the seeds. Substitute a flowering dogwood for the Bradford pear, and you’ll have pollinators in spring, along with the birds that eat them, and many, many birds eating the dogwood berries during their fall migration. Get rid of some of that lawn and plant native perennials or shrubs instead, and you’ll have a cooler backyard, less stormwater runoff, and perhaps less danger of basement flooding. Naturescaping allows nature back in. This article first appeared in the Glen Rock Gazette and on northjersey.com on July 24, 2015.